7. And he came and took the book out of the right hand of him that sat upon the throne....................Revelation 5:1 - 7. 3. And cried with a loud voice, as [when] a lion roareth: and when he had cried, seven thunders uttered their voices. Where does one start to write a preamble for a series of Messages which was so important that Seven Mighty Angels (pictured at left) were sent from eternity to instruct a prophet concerning the Mystery of the Seven Seals? Indeed, It was for this purpose (the Revelation of the Seven Seals - finishing the Mystery of God) that the ministry of Malachi 4:5-6; Luke 17:30 and Revelation 10:7 was ordained to be in the earth in the last days. In Revelation 10 above we find that John was instructed to "...Seal Up those things which the Seven Thunders uttered, and write them not.....BUT in the days of the Voice of the Seventh Angel, when he shall begin to sound, the Mystery of God should be finished, as he hath declared unto His servants the prophets". A "prophetic ministry" is here promised to come in the last days to receive from 'the Lamb' the mystery of the Opened Book. This prophetic ministry - "...the days of the Voice of the 'Seventh Angel' (Messenger), when he shall begin to sound,..." - clearly relates, NOT to an heavenly angel sounding on a trumpet, but it is the MESSENGER (a man) to the Laodicean Age Speaking to us the Word of God. The proof of this is set forth in Rev. 9:13 and Rev. 11:15. HERE are the two heavenly trumpeters. "And the SIXTH angel sounded and I heard a voice from the four horns of the golden altar which is before God saying to the SIXTH angel which hath the trumpet." (Rev. 9:13). "And the SEVENTH angel sounded and there were great voices in heaven saying, The kingdoms of this world are become the kingdoms of our Lord, etc." NOTICE in the SEVENTH trumpet that Christ is set forth as taking His rightful knigdom. BUT in Rev. 10:7 the Messenger there is still sounding, and his sounding is declaring the Mysteries of God to the Church, not through a denomination or Evangelist or Bible teacher BUT through a Prophet. Yes, this shows us that this one we call 'The Seventh Angel', is no spirit being. He is a man. He is a MESSENGER, and since he is the Last Messenger, being the Seventh Messenger, he is the Messenger to the Laodicean Age. As the Elect of God in the Ephesian Age recognized Paul as thier Messenger and paid attention to his Message, even so the Elected Seed of God in this last Age, can and will know the Seventh Angel Messenger-Prophet sent to them - they WILL hear, recognize and act on the Message he brings. Concerning the Revelation of the Mysteries which the 'prophet' Daniel saw, he was instructed to "shut up the words, and seal the book, even to the time of the end" (Daniel 12:4). In Daniel 12:9 the Angel again reminded the prophet that "...the words are closed up and sealed till the time of the end". It was through the ministry of a 'prophet' that these mysteries were received and written; and since God does not change His pattern, He would send a prophet in the End to Reveal the Mystery of Daniel's visions, etc. God's Pattern for revealing His secrets to man is through Prophets. In Amos 3:7 we read, "Surely the Lord God will do nothing, but he revealeth His secret unto His servants the Prophets". I want to tell you just one thing. I know, and I want you to remember. There's something fixing to happen. Remember, I told you that. There's a step up coming in the Church now. See? These things that you're now seeing, are going to be just little things after while. Something's a moving. And I say this by the power of the revelation of Jesus Christ... Every one in our doctrine, in our baptism, we've come to a place, but there's some key that'll unlock something here. Now, he (John) saw the Book sealed on seven seals. And Daniel saw the same, and when the thunders uttered their voices He said, "Don't write." What that was in the Scripture, but it'd be revealed in the last days. We're at the time. We're at Kadesh (Judgement Seat) right now. Amost ten years would pass before this "something" that was "fixing to happen", would actually come to pass. As in the First Two Pulls (phases) of his ministry, so in this one, the Third and final Pull, he waited on instructions from the Angel that had commissioned him in 1946. Most of the brethren associated with Brother Branham at the time were not accustomed to such leadership. They were moved more by the emotion and excitment of the Revival than by the Spirit. Brother Branham would take things one step at a time, follwoing, in simplicity, the leadership of the Holy Spirit. Many of his associates were more proned to do things in a 'big' way - big conventions, big campaigns, big crowds and big money. Visions are breaking all over the building. See? Yeah, I was trying to let this be a resurrection a little higher from the ash heap I have set on. I want a little more of a revelation. I know one thing; as long as I hold onto that first ministry, the second won't come; it didn't come. Now, as long as I hold onto the second, the third won't come. See? I've got to step right out, step out and believe it, "God said so!" Some Brethren had arranged special meetings at which Brother Branham was to be the guest speaker. Out of respect for the brethren he agreed to take the meeting. But when he arrived in the valley his throat closed up and he couldn't speak for nine days. During this time of sickness he lay in bed wondering why this had happened to him. On a Monday, after the time of those meetings had passed, he set in a chair in his room and experienced a vision. And I looked, and I seen something make a flicker over to one side. And I looked, and there was my wall opened up, and I seen Jesus. How many of you ever heard me say that I seen Jesus twice in my life in a vision? And I believed I would see Him again before the end time (See?) Now, I looked, and the skies was right out there, just looked like I looked through the wall. And there was the Bible standing right like this, great big Bible standing in the skies. Well, there's something got light around the Bible, and out of the Bible come a real pretty golden cross. And it stood out like this, and the lights coming from all around it, and out of that cross He walked. The Bible reflected the cross; the cross reflected Him. And He come walking out, and walked right down to where I was at. I can see it just as plain; I can see that cross reflecting, His hair, standing there, hung down over His face. He looked down at me like that, and He said to me, "You are waiting for your new ministry to be confirmed to you." He said, "I've already confirmed it to you. It's already confirmed. You've got to accept it." See? And I stood and listened to Him just a minute. And there He stood, talking to me. And He said, "But you walk with too many. To walk with Me, you'll walk alone." I'd seen that. I'd been catering too much to denominations and everything (You see? ); somebody trying to tell you what to do and what not to do. You got to follow Him. Now, remember the vision that He give me about the fishes, you know, and how that you couldn't teach supernatural signs to Pentecostal babies. You remember. There it was. And I'm right at the brim of this new message. God was separating Brother Branham from the influence of brethren who were walking contrary to His will. Most of these brethren were sincere, but sincerely wrong, not being able to recognize their day, it's Messenger or it's Message. By September 1962 the separation was about complete. More and more the doors were being closed in his face - he would not compromise. On September 8, 1962 he Preached a Message entitled, "The Present Stage Of My Ministry". In this message he makes reference to the "separating time" that had come for him and his Ministry. But he also believe that there was a "crowning time" also coming wherein God would crown his Ministry - the Word of God that he had preached. From here forward things begin to pick up speed as the Prophet moved closer to the time of his encounter with Seven Mighty Angels who held the Mystery of the Revelation of the Seven Seals. God began to move and Dreams and Visions began to multiply around his Ministry. It was in December 1962 that he received the vision of the Seven Angels coming to him. He lined up the Dreams, and the Visions with the Scriptures in a message entiled "Sirs, Is This The Time Of The End?" preached December 30, 1962. Then we went back, I went up in the mountain to hunt. And there Brother Fred and I, one morning when I walked out, I had already got my javelina, and I looked and seen the place where he went.....and there was no hogs. He waved at me and I seen. I went down in a canyon, some big chasms, the sun was just coming up. I come around the other side of the hill, not thinking nothing about the prophecy. Set down, waiting, resting, I thought, "What happened to those hogs?" And I set down like Indians do, you know, cross-legged, and I looked on my overall leg and there was a bullheader. I picked it up, and I said, "That's strange! Here I am, about forty miles northeast of Tucson. There's my little boy Joseph sitting there waiting for me." And as I started to look, I seen a herd of hogs come out about a thousand yards from me, up on a mountain, I throwed the bullheader down. I said, "I'll get them. I'll go get Brother Fred, and I'll hang up a piece of paper to let know which way to go on this ocotillo here, and we'll get Brother Fred." And I started up the mountain, running as hard as I could on the other side. All of a sudden, I thought somebody shot me. I never heard such a blast, it shook the whole country. And, when it did, standing before me was seven Angels in a cluster. I met Brother Fred and them a little after. Said, "What was it?" There was that circle coming up from the earth, like a mist forming. When it did, it went plumb up into the mountain, begin to circle on westward from the way it come. Science found it after a while, thirty miles high and twenty-five miles across, just exactly in the circle of the pyramid. And the other day, standing there, turned the picture to the right, and there is Jesus as He was in the Seven Church Ages, the white wig on, showing Supreme Deity. He's Alpha and Omega; He's the First and the Last; He is the Supreme Judge of all Eternity, standing there, confirmed the Message of this hour. And there shall be Light about the evening time! What's it all about? What was it? Junior Jackson listening in, you remember the dream he had that I interpreted, "going towards the setting of the sun?" And this happened on "Sunset" Mountain! It's the evening time, sunset time. The sunset Message through a setting of history, a setting of prophecy, rather, being fulfilled. And it shall be Light at the evening time upon Sunset Mountain in the Coronado Forest, forty miles north of Tucson. Get on the map and see if Sunset Peak there. That's exactly where it happened. I never know it till the other day. Everything, that shall never die, it's constantly unrolling itself. From the very thing happening, to the picture being Jesus standing looking at us, and now exactly on Sunset Mountain, and the sunset Light. The evening Light has come, God vindicating Himself. What is it? It is a fact that God and Christ are one. The "white." How many seen it, the white wig upon Him, as we talked in Revelation 1? See, the Supreme Deity, Supreme Authority! No other voice, no other god, no other nothing. "In Him dwells the fullness of the Godhead bodily." The Angels themselves was His wig. Amen. What's happened upon Mount Sunset? God confirming His Word. That's what all this noise is about. Notice, it's God fulfilling His promised Word again, of Revelation 10:1 to 7, "And in the days of the sounding of the seventh angel's Message, the mystery of God should be finished." The hidden mystery of Revelation 10:1 to 7, the last message to the last church age. Fulfills exactly, in this age, St. Luke 17:30, "The day when the Son of man shall be revealed." "And there shall rise false prophets and false Christs, show great signs and wonders, insomuch it'd deceive the Elected if possible." The people still in doubt. And, as usual, the church is just as puzzled. 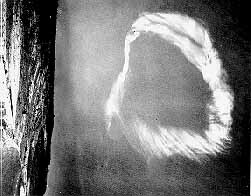 And the observatories and all of them in Tucson are still asking (about the mysterious cloud), research of science trying to find out what it is. So high there can't be fog, mist, or nothing up there. "What did it? Where's it at?" They're just as puzzled of that supernatural halo hanging yonder in the sky as they was when the Magi come in following a star, saying, "Where is He that's born King of the Jews?" What was it? God fulfilling His Word, "And there shall rise a star out of Jacob." And the God of Heaven promised the evening time would have evening Light. Three years ago this mystery was a prophecy, "What time is it, sir?" But now it's history. It's passed. The promise is fulfilled. What time is it, sir, and what's this attraction? God fulfilling His Word! He's the same yesterday, today, and forever. Following the instructions of one of the Seven Angels Brother Branham journeyed back to his home church in Jeffersonville, Indiana and from March 17th - 24th., 1963 he preached on the Revelation of the Mystery of the Seven Seals. This was his "regular commission". Everything else in his ministry was more or less filler. Previous to this series he was pointing the people to it. After the series he kept pointing the people back to this series. Of the total number of times that he mentioned the Seven Seals, about 25 per cent of those references are before March 1963; and from 1963 to 1965 he mentions the Seven Seals over 200 times - so important is this series and the Revelations contained therein. Beginning with a Message entitled, "God, hidden and revealed in Simplicity", he showed (by the Word how man has always missed what God did because of the simple people He used and the simple way in which He did it. Next Brother Branham followed with a Message called "The Breach", in which he bridged the gap between the Seven Church Ages and the Seven Seals. Then he took a night for each of the first Six Seals explaining the Mystery of the Four Horse Riders, Souls under the Altar (5th Seal), and nature taking a tumble (6th Seal). After the Sixth Seal he took a night for Questions and Answers to clear up mis-understanding the people might have. Then on the last night he preach the Mystery of the Seventh Seal. He said that of the Seven Angels that appeared to him, the Seventh Angel held the Mystery of the Seventh Seal. Number 1. The mystery of the Kingdom of heaven. That's the one we are talking on now - Matthew 13:3-15. The 3rd mystery is the mystery of the translation of the living saints at the end time of this age: I Corinthians 15 and also 1st.Thessalonians 4:14-17. The 8th mystery (See below). That's some of the mysteries that this angel is supposed to wind up, all the mysteries of God. May I say this with reverence, and not referring to myself, but referring to the Angel of God. The serpent's seed, that's been a hidden mystery all through the years. The Grace straightened out, not disgrace, but real true grace. No such a thing as an "eternal" burning hell. You'll burn for millions of years, but anything that was eternal had never beginning or end, and hell was created. All these mysteries. The Pillar of Fire returning back. Amen. That's the thing that is supposed to take place, and we see it. .....Oh, how we could go on naming the mysteries. Seeing that Pillar of Fire that led the children of Israel, the same one that struck down Saul on his road down to Damascus. And the same One, coming with the same power, doing the same things, and revealing the same Word, staying word by word with the Bible. The 8th mystery on the list from which Brother Branham was reading was "The mystery of the processes by which godlikeness is restored to man". (1st. Tim. 3:16). On February 11, 1962 he preached a Message called, "Oneness", explaining the "union" which forms the basis of the "Oneness" of God with the individual. The "Single" Printed sermons of William Branham: These are also available FREE of charge. If you wish you may have your name placed on the mailing list to receive each message as it comes off the press - One, two or more sermons every 6 - 8 weeks. From The Voice Of God Recordings office, you may obtain a FREE list of books presently available for the asking.